The walk Viola Davis will take down the red carpet Sunday night in Hollywood began decades ago, a few thousand miles from Hollywood, far away from the paparazzi and the privilege, the glitz and the glamour that now surround the Oscar nominee. Even by Hollywood standards, hers is an improbable story. 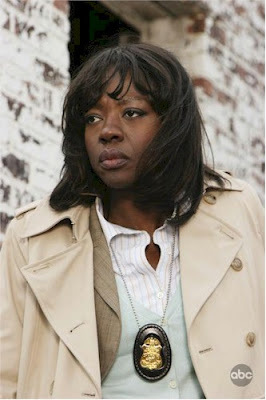 Davis overcame poverty and racism to reach the pinnacle of her acting profession. “I come from Central Falls,” Davis remarked years ago before winning a Tony Award. “I did not, growing up, ever, ever dream I could be in this place.” Others aren’t as incredulous. “We’re not completely shocked,” said Deloris Grant, Davis’ sister. While Davis has spoken with the Journal many times over the years, in this past whirlwind week before the Oscars she did not. Davis declined interview requests. So we spoke with someone very close to the source, Grant, who along with her mother are attending tonight’s ceremony. She has followed and supported all of her sister’s developments and achievements. “I am her number one fan.” Grant is an English teacher and a theater instructor at Central Falls High School. This is where Davis’ rags-to-riches road began, in the neighborhood surrounding the school. Her parents moved here in 1965. Davis, the second-youngest of six children, was just two months old. But her parents, neither of whom went beyond grade school, were poor and couldn’t afford to raise all their children. So the two oldest stayed behind in South Carolina, raised by grandparents for several years. Davis’ late father left school and home at 8 to become a horse groomer. That’s what eventually brought the family to Rhode Island: a job at Lincoln Downs and Narragansett Park. Davis’ mother, Mae Alice, left home at 13 to marry and to raise a family. Six was the turning point in Davis’ life. Her sister Dianne, who was being raised by grandparents in South Carolina, moved in with the family in Central Falls, did not like what she saw, and would not accept it. “She was so driven, it was supernatural,” Davis said in 2004. “She instilled a ferocious passion for fulfilling our dreams.” Dianne told her sisters that they’d go to college, which was bold. No one in the family had even gone to high school. While at Central Falls High School, Davis enrolled in Upward Bound, a federally funded program to provide educational support to low-income students. “The first time I met her, I was impressed with her determination, her focus and her sense of honor and her genuine spirit,” says Mariam Boyajian, director of Rhode Island Upward Bound. “She is a remarkable person.” Davis and Grant set up an endowment for the Upward Bound program. And Davis often credits the program for contributing to her success. “I’m proof positive of how social programs can totally transform your life,” Davis said in December on the TV show The View. wow this is a remarkable story. In a small town like this, I could never believe something like this would happen.